The 29.3 metre motor yacht Altisa VII, listed for sale by Tucker Fallon at Bradford Marine Yacht Sales, has been sold with the buyer introduced by Kevin Frawley at Denison Yachting. Built by Nordlund and launched in 1994, she underwent an interior refit with updates by designer Lisa Profsky in 2002 and boasts an inviting country kitchen that incorporates a relaxed dining area with a flatscreen television and large storage areas. Both the hull and superstructure of Altisa VII were constructed in GRP. 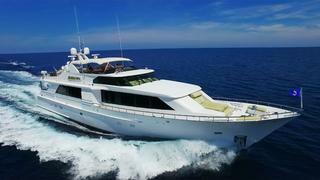 Custom built for owner-operators, she features a large, carefully looked after engine room and easily maintained living spaces for new owner-operators. However, she does also offer large captain’s quarters and accommodation for two crew members should a new owner wish to employ crew. Guest accommodation is for eight split across four well-proportioned double cabins. The yacht’s interior boasts beautifully finished woodwork with neutral-toned fittings and plenty of space for relaxing, dining and entertaining in comfort. With the owner-operator spending much of his time on the flybridge, this is an ideal area for simultaneously relaxing with guests and captaining the yacht, offering a large seating area and Jacuzzi. The spacious aft deck is also well equipped for entertaining with a barbecue and a comfortable seating area. Powered by twin 1,530hp Caterpillar engines, Altisa VII can reach a top speed of 26 knots with a cruising speed of 23 knots. With a beam of 6.25 metres and a draught of just 1.7 metres, Altisa VII is ideal for cruising in the shallow waters of The Bahamas and Caribbean and has never been chartered. Altisa VII was asking $1,595,000.